© 2008 Every Dog Can, Inc.
Deborah Grodecka, CDBC, CPDT, founder and president of Every Dog Can, Inc., is passionate about helping people and their dogs discover how they can live together happily and harmoniously. She is a highly qualified dog behavior professional with extensive experience as both a dog trainer and a dog behavior specialist. Deborah understands dogs and how they learn. She has gained this knowledge through education and study with many of the most respected experts working in the field today. This is balanced with her own hands-on training and behavior work with thousands of dogs. Outstanding communication and teaching skills sharpened over thousands of hours of classes, private lessons, behavior counseling sessions, and educational presentations to the public. True empathy for clients with dogs displaying extreme behavior because she has walked in their shoes. She has lived with seriously aggressive dogs and knows how to manage and rehabilitate them. Unwavering commitment to science-based positive reinforcement training methods, rejecting the use of force, intimidation, punishment, dominance, or other aversive techniques to train our best friends. Success in house training dogs with chronic house soiling problems that were declared "untrainable." Commitment to evaluating and training shelter and rescue dogs to increase their adoptability and enable them to be successfully placed in lifelong loving homes. One of the very few nationally Certified Professional Dog Trainers and Certified Dog Behavior Consultants active in the state of Arkansas. Certified Dog Behavior Consultant (CDBC), International Association of Animal Behavior Consultants. As a Certified Member of the IAABC, Deborah meets exacting professional standards for behavioral education and experience, and is held to the highest ethical standards for the practice of dog behavior consulting and dog behavior rehabilitation. Certified Professional Dog Trainer (CPDT), Certification Council for Professional Dog Trainers. Deborah is one of an elite group of professional dog trainers nationally certified by the CCPDT through criteria based on humane training practices, a high level of competence, validated experience, and the latest scientific knowledge related to dog training. Professional Member, Association of Pet Dog Trainers. Deborah's professional level membership in the APDT demonstrates her commitment to staying current with the most up-to-date science-based training methodologies and behavioral research. The APDT promotes professional growth through its continuing education programs for dog trainers, and works to increase public awareness of positive reinforcement, dog-friendly training techniques. 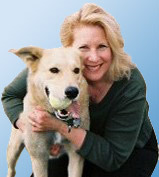 Former Staff Behaviorist and Trainer, Animal Rescue League of Boston Behavior Services. Deborah evaluated dogs with a wide variety of behavior issues; she designed and implemented rehabilitation programs for dogs prior to special adoption; she trained, counseled and taught staff, volunteers, and adopters about dog behavior; and she presented educational lectures to animal care professionals and the public. Deborah worked closely with Behavior Services Director and internationally known veterinarian and Certified Applied Animal Behaviorist Dr. Amy Marder to design and refine a system to more accurately assess the behavior of dogs relinquished to shelters. Certificate in Training and Behavior Counseling with Honors from the prestigious San Francisco SPCA Academy for Dog Trainers. Deborah was taught by Jean Donaldson, Academy Director and renowned trainer and behaviorist, and author of acclaimed books on dog behavior including the ground-breaking classic The Culture Clash. Proven Experience in Northwest Arkansas. Deborah has taught thousands of hours of dog obedience classes and private dog training lessons, from puppy kindergarten to advanced off-leash obedience; and she has worked with hundreds of families to resolve serious dog behavior problems. Veterinarians throughout the area refer their clients to her for professional services. Deborah is a sought-after public speaker and educator on dog behavior, and regularly gives presentations to local veterinarians and their clinic staff, dog daycares, boarding and grooming and other dog-related businesses, community groups, and to the public. She is the pet training expert on the popular local television show, All Pets Considered (channel 22 on Cox Cable). Commitment to Continuing Education. Deborah regularly attends conferences, seminars, workshops, and leading edge instructor training courses where she has learned from the best in the business, including Ian Dunbar, Karen Pryor, Jean Donaldson, Patricia McConnell, Pat Miller, Karen Overall, Bob Bailey, Ray Coppinger, Susan Friedman, Roger Abrantes, Pamela Reid, Leslie Nelson, James Serpell, Kathy Sdao, Suzanne Hetts, Temple Grandin, Suzanne Clothier, Pia Silvani, Chris Bach, Veronica Boutelle, Trish King, Terry Ryan, Brenda Aloff, Morgan Spector, Linda Tellington-Jones, Turid Rugaas, and Nicholas Dodman. Deborah established Every Dog Can, Inc. in 2001 in Boston, Massachusetts, and relocated her practice to Northwest Arkansas in 2006. She and her husband live in Rogers, Arkansas, with two wonderful dogs, Hildy, a German Shepherd Dog, and Sammy, a Husky/Shepherd/Retriever mix, both of whom were adopted from shelters in Massachusetts.